d: 666) was a Companion of Rasulullah SAW. Muhammad Ibn Maslamah RA was among the first in Yathrib (Madinah Al Munawarrah) to become a Muslim and was a halif or an ally of the Aus tribe in Madinah, indicating he was not an Arab. He became a Muslim at the hands of Musab ibn Umair RA, before Usaid ibn Hudair RA and Sad ibn Muadh RA who were influential men in Madinah Al Munawarrah. In 622 when Rasulullah SAW arrived in Madinah he paired off each Muhajir with one of the Ansar, joining Muhammad ibn Maslamah RA with Abu Ubaidah ibn al-Jarrah RA. Muhammad ibn Maslamah RA took part in all the military engagements of Rasulullah SAW except the Battle of Tabuk. On that occasion, he and Saidina Ali RA were put in charge of an army which was left behind to protect Madinah. After sometime at his late age, he relate these battles to his ten children. Before the Battle of Uhud, Rasulullah SAW and the Muslim force numbering some seven hundred persons spent a night in an open camp. He put fifty men under the command of Muhammad ibn Maslamah RA and entrusted him with patrolling the camp at night. During the battle itself, after the disastrous rout of the Muslims by the Quraish, a small band defended Rasulullah SAW till the tide of battle turned. Muhammad ibn Maslamah RA was among them. During the caliphate of Saidina Umar Al Khattab RA (634 - 644), Muhammad ibn Maslamah RA was put in charge of a special office established to investigate complaints against officers of the state. When Amr ibn al-Aas RA requested reinforcements during his expedition to Egypt, Saidina Umar Al Khattab RA sent him four detachments of one thousand men each, led by Muhammad ibn Maslamah RA, az-Zubayr ibn aI-Awwam RA, Ubadah ibn as-Samit RA and al-Miqdad ibn al-Aswad RA. Muhammad ibn Maslamah RA also served Saidina Umar's successor, Saidina Uthman RA. When the latter was killed in 656 and civil war broke out Muhammad Al Maslamah RA did not participate, deliberately broking the sword he always used and which was given to him by Rasulullah SAW. During this time, he was known as the "Knight of Rasulullah" and by refusing to use the sword against Muslims he preserved this reputation. 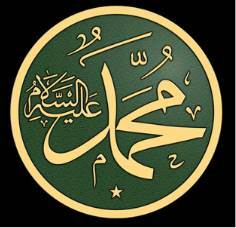 Muhammad ibn Maslamah RA died in Madinah, April 666 at the age of seventy seven. He was involved in the expulsion of the Banu Nadir from Madinah, one the Jewish tribe which broke the agreement or the well-known Commonwealth of Madinah. He Killed Ka'b ibn al-Ashraf the leader of the Jewish tribe and Muhammad Al Maslamah RA was married with two sons. Black, tall and sturdy, Muhammad ibn Maslamah RA towered above his contemporaries. He was a giant among the companions of Rasulullah SAW, a giant in body and a giant in deeds. Significantly he was called Muhammad even before he became a Muslim. It would seem that his name was itself a pointer to the fact that he was among the first of the Yathribites (Madinah) to become a Muslim and to follow the teachings of the great Rasulullah. 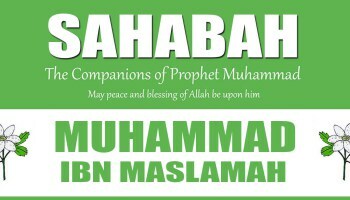 (The name Muhammad was practically unknown at the time but since the Rasulullah SAW encouraged Muslims to name themselves after him, it has become one of the most widely used names in the world.) Muhammad ibn Maslamah RA was a halif or an ally of the Aus tribe in Madinah indicating that he himself was not an Arab. He became a Muslim at the hands of Musab ibn Umair RA, the first missionary sent out by Rasulullah from Makkah to Madinah. He accepted Islam even before men like Usaid ibn Hudair RA and Sad ibn Muadh RA who were influential men in the city. When the Prophet, peace be on him, came to Madinah, he adopted the unique method of strengthening the bonds of brotherhood between the Muhajirin and the Ansar. He paired off each Muhajir with one of the Ansar. This arrangement also helped to relieve the immediate needs of the Muhajirin for shelter and food and created an integrated community of believers. Rasulullah SAW was a keen observer of character and temperament and was concerned to join in brotherhood persons of similar attitudes and tastes. He joined in brotherhood Muhammad ibn Maslamah RA and Abu Ubaidah ibn al-Jarrah RA. Like Abu Ubaidah RA, Muhammad ibn Maslamah RA was quiet and pensive and had a strong sense of trust and devotion. He was also brave and resolute in action. He was a distinguished horseman who performed feats of heroism and sacrifice in the service of Islam. Muhammad ibn Maslamah RA took part in all the military engagements of Rasulullah SAW except the expedition to Tabuk. On that occasion, Muhammad Al Maslamah RA and Saidina Ali RA were put in charge of an army which was left behind to protect Madinah. Later in life, he would often relate scenes of these battles to his ten children. There are many instances in the life of Muhammad ibn Maslamah RA which showed what a dependable and trustworthy person he was. Before the start of hostilities at the Battle of Uhud, Rasulullah SAW and the Muslim force numbering some seven hundred persons spent a night in an open camp. He put fifty men under the command of Muhammad ibn Maslamah RA and entrusted him with the task of patrolling the camp the whole night. During the battle itself, after the disastrous rout of the Muslims by the Quraish during which abo ut seventy Muslims lost their lives and many fled in every possible direction, a small band of the faithful bravely defended Rasulullah SAW till the tide of battle turned. Muhammad ibn Maslamah RA was among them. Muhammad ibn Maslamah RA was quick to respond to the call of action. He once stood listening to Rasulullah SAW as he spoke to the Muslims about the designs of some of the Jewish leaders in the region. At the beginning of his stay in Madinah, Rasulullah SAW had concluded an agreement with the Jews of the city which said in part: "The Jews who attach themselves to our commonwealth shall be protected from all insults and harassment. They shall have equal rights as our own people to our assistance...They shall join the Muslims in defending Madinah against all enemies...They shall not declare war nor enter in treaty or agreement against the Muslims." Jewish leaders had violated this agreement by encouraging the Quraish and tribes around Madinah in their designs against the state. They were also bent on creating, discord among the people of Madinah in order to weaken the influence of Islam. After the resounding victory of the Muslims over the Quraish at the Battle of Badr, one of the three main Jewish groups in Madinah, the Banu Qaynuqa was especially furious and issued a petulant challenge to Rasulullah SAW. They said: "O Muhammad! You really think that we are like your people (the Quraish)? Don't be deceived. You confronted a people who have no knowledge of war and you took the chance to rout them. If you were to fight against us you would indeed know that we arc men." They thus spurned their agreement with Rasulullah SAW and issued an open challenge to fight. The Qaynuqa however were goldsmiths who dominated the market in Madinah. They were depending on their allies, the Khazraj, to help them in their declared war. The Khazraj refused. Rasulullah SAW placed the Banu Qaynuqa's quarters under a siege which lasted for fifteen nights. The fainthearted Qaynuqa finally decided to surrender and ask Rasulullah SAW for a free passage out of Madinah. Rasulullah SAW allowed them to leave and the tribe - men, women and children - left unharmed. They had to leave behind them their arms and their goldsmith's equipment. They settled down at Adhraat in Syria. The departure of the Qaynuqa did not end Jewish feelings of animosity towards Rasulullah SAW although the nonaggression agreement was still in force. One of those who were consumed with hatred against Rasulullah SAW and the Muslims and who openly gave vent to his rage was Kab ibn al-Ashraf. Kab's father was in fact an Arab who had fled to Madinah after committing a crime. He became an ally of the Banu Nadir, another important Jewish group, and married a Jewish lady name Aqilah bint Abu-l Haqiq. She was Kab's mother. Kab was a tall and impressive looking person. He was a well-known poet and was one of the richest men among the Jews. He lived in a castle on the outskirts of Madinah where he had extensive palm groves. He was regarded as a Jewish leader of importance throughout the Hijaz. He provided means of support and sponsorship to many Jewish rabbis. Kab was openly hostile to Islam. He lampooned Rasulullah SAW, besmirched in verse the reputation of Muslim women, and incited the tribes in and around Madinah against Rasulullah SAW and Islam. He was particularly distressed when he heard the news of the Muslim victory at Badr. When he saw the returning army with the Quraish prisoners of war, he was bitter and furious. He took it upon himself then to make the long journey to Makkah to express his grief and to incite the Quraish to take further revenge. He also went to other areas, from tribe to tribe, urging people to take up arms against Rasulullah SAW. News of his activities reached Rasulullah SAW, who prayed: "O Lord, rid me of the son of Ashfar, however You wish." Kab had become a real danger to the state of peace and mutual trust which Rasulullah SAW was struggling to achieve in Madinah. Kab returned to Madinah and continued his verbal attacks on Rasulullah SAW and his abuse of Muslim women. He refused, after warnings from Rasulullah SAW, to stop his dirty campaign and sinister intrigues. He was bent on fomenting a revolt against Rasulullah SAW and the Muslims in Madinah. By all these actions, Kab had openly declared war against Rasulullah SAW and Islam. He was dangerous and a public enemy to the nascent Muslim state. Rasulullah SAW was quite exasperated with him and said to the Muslims: "Who will deal with Kab ibn al-Ashraf? He has offended Allah and His Rasul." "I shall deal with him for you, O Rasul of Allah," volunteered Muhammad ibn Maslamah RA. This, however, was no easy undertaking. Muhammad ibn Maslamah RA, according to one report, went home and stayed for three days without either eating or drinking, just thinking about what he had to do. Rasulullah SAW heard of this, called him and asked him why he had not been eating or drinking. He replied: "O Rasulullah, I gave an undertaking to you but I do not know whether I can accomplish it or not." 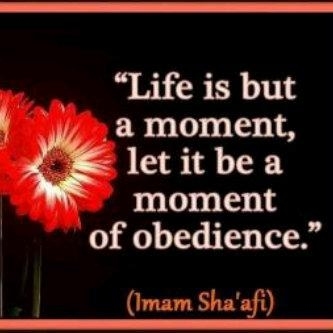 "Your duty is only to try your utmost," replied Rasulullah SAW. Muhammad ibn Maslamah RA then went to some other companions of Rasulullah SAW and told them what he had undertaken to do. They included Abu Nailah, a foster brother of Kab ibn al-Ahsraf. They agreed to help him and he devised a plan to accomplish the mission. They went back to Rasulullah SAW to seek his approval since the plan involved enticing Kab ibn Asraf from his fortress residence through some deception. Rasulullah SAW gave his consent on the principle that war involved deceit. 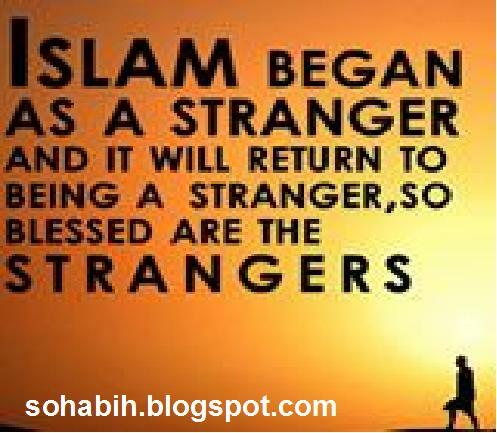 Both Muhammad ibn Maslamah RA (who was in fact a nephew of Kab by fosterage) and Abu Nailah then went to Kab's residence. Muhammad ibn Maslamah RA was the first to speak: "This man (meaning Rasulullah SAW) has asked us for sadaqah (charitable tax) and we cannot even find food to eat. He is oppressing us with his laws and prohibitions and I thought I could come to you to ask for a loan." "By God, I am much more dissatisfied with him," confessed Kab. "We have followed him but we do not want to leave him until we see how this whole business will end. We would like you to lend us a wasaq or two of gold," continued Muhammad ibn Maslamah RA. "Isn't it about time that you realize what falsehood you are tolerating from him? Asked Kab as he promised to give them the loan. "However," he said, "You must provide security (for the loan)." "What security do you want?" they asked. "Give me your wives as security," he suggested. "How can we give you our wives as security," they protested, "when you are the most handsome of Arabs?" "Then give me your children as security," Kab suggested. "How can we give you our children as security when any one of them would thereafter be ridiculed by being called a hostage for one or two wasaqs of gold? This would be a disgrace to us. But we could give you our (means of) protection (meaning weapons) since you know that we need them." Kab agreed to this suggestion which they had made to disabuse his mind of any notion that they had come armed. They promised to come back to him again to bring the weapons. Meanwhile, Abu Nailah also came up to Kab and said: "Woe to you, Ibn Ashraf. I have come to you intending to mention something to you and you do not encourage me." Kab asked him to go on and Abu Nailah said: "The coming of this man to us has been a source of affliction to our Arab customs. With one shot he has severed our ways and left families hungry and in difficulties. We and our families are struggling." Kab replied: "I, Ibn al-Ashraf, by God, I had told you, son of Salamah, that the matter would end up as I predicted." Abu Nailah replied: "I wish you could sell us some food and we would give you whatever form of security and trust required. Be good to us. I have friends who share my views on this and I want to bring them to you so that you could sell them some food and deal well towards them. We will come to you and pledge our shields and weapons to you as security." "There is loyalty and good faith in weapons," agreed Kab. With this they left promising to return and bring the required security for the loan. They went back to Rasulullah SAW and reported to him what had happened. That night, Muhammad ibn Maslamah RA, Abu Nailah, Abbad ibn Bisnr RA, Al-Harith ibn Aws RA and Abu Abasah ibn Jabr RA all set off for Kab’s house. 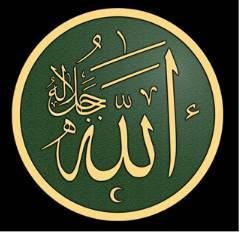 Rasulullah SAW went with them for a short distance and parted with the words: "Go forth in the name of Allah." And he prayed: "O Lord, help them." Rasulullah SAW returned home. It was a moonlit night in the month of Rabi al-Awwal in the third year of the hijrah. 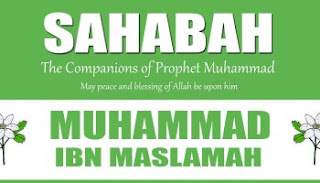 Muhammad ibn Maslamah RA and the four with him reached Kab's house. They called out to him. As he got out of bed, his wife held him and warned: "You are a man at war. People at war do not go down at such an hour." 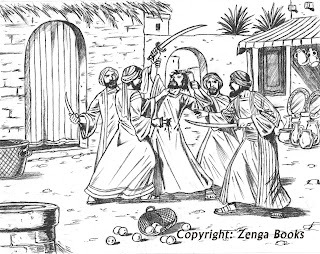 "It is only my nephew Muhammad ibn Maslamah and my foster brother, Abu Nailah..." Kab came down with his sword drawn. He was heavily scented with the perfume of musk. "I have not smelt such a pleasant scent as today," greeted Muhammad ibn Maslamah RA. "Let me smell your head." Kab agreed and as Muhammad bent over, he grasped Kab's head firmly and called on the others to strike down the enemy of Allah. (Details of this incident vary somewhat. Some reports state that it was Abu Nailah who gave the command to strike down Kab and this was done after Kab had emerged from his house and walked with them for some time. ) The elimination of Kab ibn al-Ashraf struck terror into the hearts of those, and there were many of them in Madinah, who plotted and intrigued against Rasulullah SAW. Such open hostility as Kab's diminished for a time but certainly did not cease. At the beginning of the fourth year of the hijrah, Rasulullah SAW went to the Jewish tribe of Banu Nadir on the outskirts of Madinah to seek their help on a certain matter. While among them, he found out that they were planning to kill him then and there. He had to take decisive action. The Banu Nadir had gone too far. Straight away, Rasulullah SAW went back to the center of the city. He summoned Muhammad ibn Maslamah RA and sent him to inform the Banu Nadir that they had to leave Madinah within ten days because of their treacherous behavior and that any one of them seen after that in the city would forfeit his life. Illustration Only: Muhammad ibn Maslamah - Slayer of the Ka'ab. One can just imagine Muhammad ibn Maslamah RA addressing the Banu Nadir. His towering stature and his loud and clear voice combined to let the Banu Nadir know that Rasulullah SAW meant every word he said and that they had to stand the consequences of their treacherous acts. The fact that Rasulullah SAW chose Muhammad ibn Maslamah RA for the task is a tribute to his loyalty, courage and firmness. Further details of the expulsion of the Banu Nadir from Madinah do not concern us here: their plan to resist Rasulullah SAW with outside help; Rasulullah’s siege of their district and their eventual surrender and evacuation mainly to Khaibar in the north of Madinah. Two of the Banu Nadir though became MusIims - Yamin ibn Umair RA and Abu Sad ibn Wahb RA. All this happened exactly one year after the elimination of Kab ibn al-Ashraf. Both during the time of Rasulullah SAW and after, Muhammad ibn Maslamah RA was known for carrying out any assignment he accepted exactly as he was ordered, neither doing more nor less than he was asked to do. It was these qualities which made Saidina Umar RA choose him as one of his ministers and as a trusted friend and guide. When Amr ibn al-Aas RA requested reinforcements during his expedition to Egypt, Saidina Umar Al Khattab RA sent him four detachments of one thousand men each. Leading these detachments were Muhammad ibn Maslamah RA, az-Zubayr ibn aI-Awwam RA, Ubadah ibn as-Samit RA and al-Miqdad ibn al-As wad RA. To Amr, Saidina Umar RA sent a message saying, "Let me remind you that I am sending Muhammad ibn Maslamah RA to you to help you distribute your wealth. Accommodate him and forgive any harshness of his towards you." Ibn Maslamah RA went to Amr RA in Fustat (near present-day Cairo).. He sat at his table but did not touch the food. Amr RA asked him: "Did Saidina Umar RA prevent you from tasting my food?" "No," replied ibn Maslamah RA, "he did not prevent me from having your food but neither did he command me to eat of it." He then placed a flat loaf of bread on the table and ate it with salt. Amr RA became upset and said: "May Allah bring to an end the time in which we work for Saidina Umar ibn al-Khattab! I have witnessed a time when al-Khattab and his son Umar were wandering around wearing clothes which could not even cover them properly while Al-Aas ibn Wail (Amr's father) sported brocade lined with gold..." "As for your father and the father of Umar, they are in hell," retorted Muhammad ibn Maslamah RA, because they did not accept Islam. "As for you, if Saidina Umar RA did not give you an appointment, you would have been pleased with what you got from their udders," continued Ibn Maslamah RA obviously disabusing Amr's mind of any ideas he might have of appearing superior because he was the governor of Egypt. "Assemblies must be conducted as a form of trust," said Amr RA in an attempt to diffuse the situation and Muhammad ibn Maslamah RA replied: "Oh yes, so long as Saidina Umar RA is alive." He wanted to impress upon people the justice of Saidina Umar RA and the egalitarian teachings of Islam. Muhammad ibn Maslamah RA was a veritable scourge against all arrogant and haughty behavior. On another occasion and at another end of the Muslim state under his caliphate, Saidina Umar RA heard that the famous Sad ibn Abi Waqqas RA was building a palace at Kufa. Saidina Umar RA sent Muhammad ibn Maslamah RA to deal with the situation. On reaching Kufa, Muhammad ibn Maslamah RA promptly burnt the palace down. One does not know whether people were more surprised by the instructions of Saidina Umar RA or by the humiliation of Sad ibn Abi Waqqas RA, the famed fighter, conqueror at Qadisiyyah, and the one praised by Rasulullah SAW himself for his sacrifices at Uhud. Sad ibn Abi Waqqas RA did not say a word. This was all part of the great process of self-criticism and rectification which helped to make Islam spread and establish it on foundations of justice and piety. Muhammad ibn Maslamah RA served Saidina Umar's successor, Saidina Uthman ibn Affan RA, faithfully. When, however, the latter was killed and civil war broke out among the Muslims, Muhammad ibn Maslamah RA did not participate. The sword which he always used and which was given to him by Rasulullah SAW himself he deliberately broke. During the time of Rasulullah SAW, he was known as the "Knight of Rasulullah". By refusing to use the sword against Muslims he preserved this reputation undiminished. Subsequently, he made a sword from wood and fashioned it well. He placed it in a scabbard and hung it inside his house. When he was asked about it he said: "I simply hang it there to terrify people." Muhammad ibn Maslamah RA died in Madinah in the month of Safar in the year 46 AH. He was seventy seven years old. It takes a great mind to achieve great things and only men of distinct virtues go the extra mile to achieve the impossible. When the rolls of sages of the Ummah are to be called, Muhammad ibn Maslamah RA would rank among the highest. Black, tall and sturdy in status, ibn Maslamah RA is a giant in status and in deeds. The blessed body of our model in this issue housed the noblest of virtues inherited through intimate interaction with the best of creation, Habibullah, Muhammad SAW al Mustafa . Muhammad ibn Maslamah RA was also known as Muhammad before embracing Islam at the hand of the exalted Mus'ab ibn Umair RA the first envoy of Islam to Madina Al Munawarrah. Quiet and pensive, Muhammad ibn Maslamah RA combined strong sense of trust, devotion, bravery with being resolute in action. Paired with the noble Abu Ubaidah ibn al-Jarrah RA when the Muhajir arrived, they formed a two man army of minds that enemies feared more than battalions of ordinary men. History recorded this great sage to be a non-Arab but an ally of the Aws tribe of Madina. He embraced Islam with the fervour of a soul desperately in search of guidance, even ahead of great Ansar like Usaid ibn Hudair and Saad ibn Muadh. 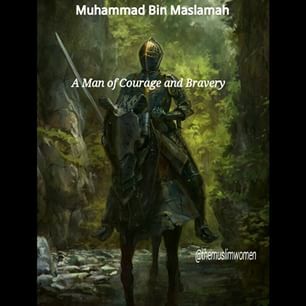 Rated as the distinguished horseman of great heroism and sacrifice in the service of Islam, volumes of books would be inadequate to detail his feat of heroic deeds in the cause of Allah SWT. Muhammad ibn Maslamah RA embraced Islam and laid down his blood, and his life to support it. The fact that he participated in all military engagements of Rasulullah SAW except the expedition of Tabuk is enough a testimony to the resolute commitment of this noble personage to the success of Allah's Deen. It is on record that this exalted sage had the special honour of commanding the army left to defend the city of Rasulullah alongside the exalted Saidina Ali RA . Countless are events depicting the heroic exploits of ibn Maslamah RA showing how dependable and trustworthy he was. He ranked among the most famous in the Battle of Uhud. The first night at Uhud witnessed Muslims numbering about seven hundred sleeping in the open. The exalted Rasulullah SAW appointed fifty men to stay awake patrolling the camp throughout the night. Muhammad ibn Maslamah RA was the head of this special force. When the battle proper came and things went so hard that seventy great Muslims attained martyrdom, a small band of men with large hearts staked their lives to defend Rasulullah u until the tide of the battle turned. Muhammad ibn Maslamah RA was among them. It is one great feat to be resolutely committed to a noble cause because the worth of man is the value of what he lives for. But it is an invaluable status to always be at the ready to stick out one's neck at the most difficult periods of threats and dangers to one chosen cause. This is where Muhammad ibn Maslamah RA ranked among the noblest fore runners of Islam. The accounts here-under are sample testimonies to this reality. O Muhammad! You really think that we are like your people (the Quraish of Makkah)? Do not be deceived. You confronted a people who have no knowledge of war and you took the chance to rout them. If you were to fight against us you would indeed know that we are men. They, with this challenge, braced up for war counting on the support of the Khazraj. The Khazraj were clever enough to see that defeat would become the lots of those who confront these men of light who see their success in holding the banner of Islam aloft alive or dead. And their enemies dead though alive. The Khazraj refused to support the Banu Qaynuqa and their quarters was under complete blockade from outside world for fifteen days. The faint-hearted Qaynuqa finally surrender requesting a free passage out of Madinah. They left Madinah with their women and children having to leave behind their smith equipment. They settled down at Adhraat in Syria. Muhammad ibn Maslamah RA readily offered his service saying: 'I shall deal with him for you, Ya Rasulullah.’ The task of dealing with Kab and ending his insolence and sinister intrigues was anything but easy. Kab is a man of war, living in a fortified castle with extensive groves, guards and numerous supporters. The task weighed so much on Ibn Maslamah RA that he stayed home, thinking of how to get rid of the nuisance called Kab, for three days without eating and drinking. Rasulullah SAW promptly replied; 'Your duty is only to try your utmost.’ Allah SWT helped Muslims to remove an avowed enemy through the hands of Muhammad bn Maslamah RA, Abu Nailah, Abbad bn Bishr, Al-Harith bn Aws and Abu Hassan ibn Jabr . Kab fell on a moonlit night in the auspicious month of Rabiul-Awwal in third year of Hijra. Ever ready to lay his life down in the service of Rasulullah SAW, ibn Maslamah RA presented the best example of 'if you finish, then further your struggle'. The elimination of the haughty Kab was no mean achievement but this would not in any way suggest the end of the war between the forces of evil and forces of right. This confrontation would last from the beginning to the end of creation, but the end belongs to the steadfast among the believers. The end of Kab struck terror into the hearts of plotters and promoters of intrigues against Islam. They went under but never gave up. About a year after Kab, Rasulullah SAW went to the Jewish tribe of Banu Nadir on the outskirts of Medina to discuss some issues. The Jews saw this as an opportunity to kill Rasulullah SAW. Allah saved Rasulullah SAW and straight away, the exalted Rasulullah SAW went to the center of the city where he sent for Muhammad ibn Maslamah RA. When he turned up, Rasulullah SAW sent him to inform the Banu Nadir that they have to pay for their treachery by living Madinah within ten days. This is one great day of honour in the life of ibn Maslamah t. He addressed the Banu Nadir with the force and voice of a man living with reality, his towering figure and clear tone registering in unmistaken terms the fact that the Prophet u meant every word of his directive. This great speech evokes light in the hearts of Yamin ibn Umair and Abu Sad ibn Wahby who promptly accepted Islam. This and other tasking assignment given to ibn Maslamah RA whenever the Ummah was in danger is a testimony to his loyalty, courage and firmness. After the passing away of Rasulullah SAW, ibn Maslamah RA remained absolutely committed to the uplift of the Deen. As a matter of fact Saidina Umar Al Khattab RA chose him not only as his ministers, but also a trusted friend and guide. When Amr al- As RA one of the greatest genius the world has seen requested re-enforcements during his expedition to Egypt, Saidina Umar RA promptly sent four detachments of one thousand men each. Leading these detachments were Muhammad ibn Maslamah RA, Zubayr ibn Awwam, Ubada ibn as-Samit and Miqdad ibn al-Aswad. As ibn Maslamah RA left with his men, Saidina Umar RA wrote a note to Amr bn al-As RA which says among other things: Let me remind you that I am sending Muhammad ibn Maslamah RA to you to help you distribute your wealth. Accommodate him and forgive any harshness of his towards you. When ibn Maslamah RA visited Amr bn al-As RA in Fustat near present day Cairo he sat at his table but refused his delicious meal. Surprised, Amr bin Al As RA asked: ‘Did 'Umar asked you not to take my food?’ To this question he replied; 'No, he did not asked me to avoid your food neither did he command me to eat it.' He then placed a flat loaf of bread on the table and ate it with salt. Muhammad ibn Maslamah’s RA life remains that of austerity and ease when Islam has become the religion of millions just as it was when Islam was a religion of few. Indeed, he spent his blessed days emphasizing moderate living. History recorded that his first assignment on the reaching Kufa at the instance of Sasidina Umar RA was the demolition of the state palace constructed by noble and exalted Sa'ad ibn Abi Waqqas RA, the famous fighter, the conqueror of Qadisiyyah and the one deserving a special praise from the exalted Rasulullah SAW for his gallantry. Sa'ad, kept silent as his palace went into ruin in the spirit of self-criticism and rectification, he submitted his affairs to Allah and His Rasul. Saidina Uthman bn Affan RA too could not dispense with the service of Muhammad bn Maslamah RA who served him faithfully until his martyrdom. After the passing away of Saidina Uthman ibn Affan RA and commencement of hostilities among camps of believers, ibn Maslamah RA immediately broke his invaluable sword, a special gift from Habibullah Rasulullah SAW. The sword was to repel the enemies but never to shed Muslims' blood. The sun of guidance, loyalty and rectitude set in Madinah in the month of Safar in the year 46 A.H. Muhammad ibn Maslamah RA left taking much of the world's loyalty and selfless service with him. He was seventy years old. "Umar bin Khattab consulted the people concerning a woman who had been caused to miscarry. Al-Mughirah bin Shubah said: 'I saw the messenger of Allah (saw) rule that a slave, male or female, be given as blood money (for a fetus).' 'Umar said: 'Bring me someone who will testify alongside you. So he brought Muhammad bin maslamah to testify along with him.'" that Abu Humayd, Abu Usayd, Sahl bin Sa'd and Muhammad ibn maslamah (RA) assembled somewhere and discussed the prayer of Allah's Messenger (SAW). Abu Humayd said that he knew of it more than anyone of them. When the Prophet (SAW) sat down for tashahhud, he stretched his left foot and turned the toes of the right foot to the qiblah. Then he put his right hand over his right knee and left over the left knee, and indicated with his index finger. Illustration Only: The Pious Warrior of Islam. one of us received an arrowhead and a feather, and the other an arrow-shaft as a share from the booty. He then reported: The Apostle of Allah (peace_be_upon_him) said: You may live for a long time after I am gone, Ruwayfi', so, tell people that if anyone ties his beard or wears round his neck a string to ward off the evil eye, or cleanses himself with animal dung or bone, Muhammad has nothing to do with him.